Please don’t pinch me…I bruise like a tomato. And why the pinching? I would never pinch you…unless you were just sitting there, minding your own business…then I might pinch the back of your arm (tricep region) for no good reason at all…just to make you jump. I have an evil streak…it is true. Truth be told…One of my best St. Patrick’s Days was spent in a blue sweatshirt. While I felt like an oddball (at first) it just gave me more reason to keep a green beer in my hand at all times 🙂 And green beer…I wish it was more than just green food coloring. I forgot to bake a cake with Guinness. I didn’t make any cornbeef something or other…There is no cabbage to be had here. I didn’t even use a shot of whiskey in one dish. And Baileys…still sitting on my counter. Yikes! But in my defense…I don’t need a holiday to put Irish something or other into my dishes. Brownies made with Baileys…out of this world. Pot roast made with Guinness….bonkers good. And Irish coffee….spend a weekend morning with my dad, and you will have your fill. 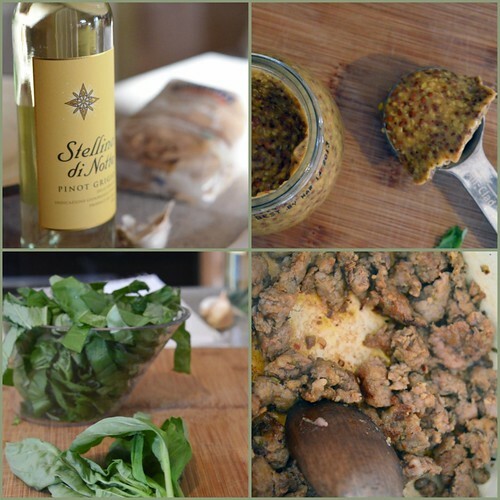 So if you want a recipe for something festive and Irishy – check out…. Oh and me… I did make these once. 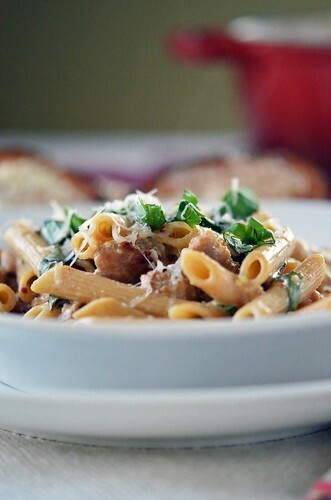 But if you want some pasta…tossed in a creamy mustardy sauce with sausage and basil…keep reading. 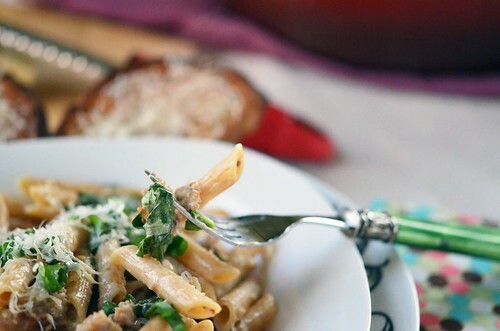 Basil is green…totally counts for a St. Patrick’s Day meal. Do Italians celebrate St. Patrick’s Day or is it just us and Ireland…or is it just us? Bring a large pot of salted water to a boil. Add pasta and cook until al dente (about 8 minutes). Drain. Meanwhile, in a large dutch oven/deep skillet heat olive oil over medium heat. 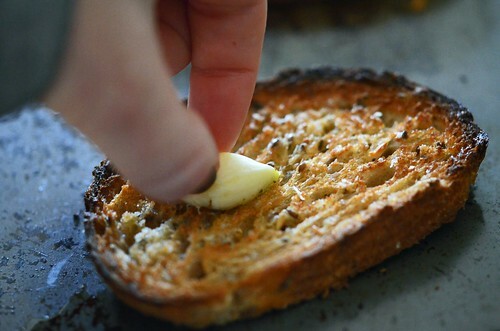 Add minced garlic and saute for about 1-2 minutes. Do not brown. If it begins to brown, reduce heat. Add sausage and brown for about 5-7 minutes. Break up the sausage as it cooks. Once sausage is cooked through and browned on all sides, add wine and bring to a simmer. Scrape up the browned tidbits on the bottom of the pan (where the flavor is). Simmer until the liquid is reduced by half (about 5 minutes). Stir in half and half, mustard, and crushed red pepper. Bring to a simmer and cook for about 2 minutes…it will thicken slightly. Remove from heat and toss in pasta and sliced basil. Toss to coat. Serve immediately. Best served with crusty toasted bread and a nice glass of wine.